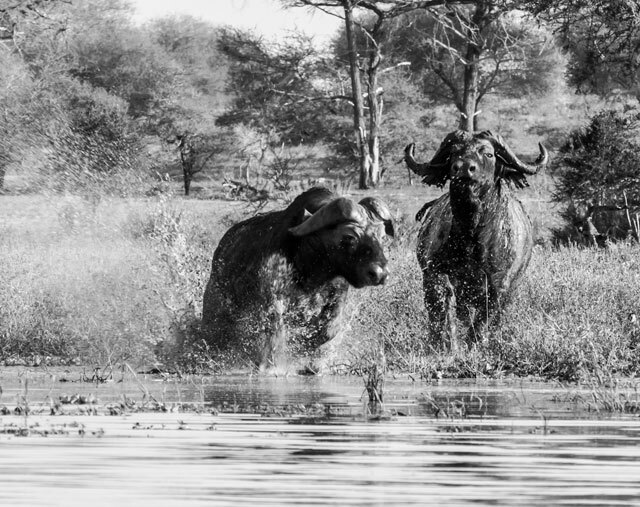 With the season now in full flow and having been out on regular safari’s for the past month and a half, we are really starting to get a good feel for the game movements at this particular time and consequently the sightings are coming thick and fast. Numerous herds of buffalo’s have been moving through the area and watching such a huge mass of life at a distance across the plains in front of camp looks almost like swarming ants blackening the grasslands. But once you get up close and personal with these massive beasts you realize the size and power of them. The bull pictured here attempted to assert his dominance after thrashing at bushes and adorning his two broken horns with vegetation. The clash was short but tense and the noise produced by the coming together of two such bull’s is enough for one to catch ones breath. This attempt however was doomed to fail, however prettily adorned the challenger, he was quickly dealt with and chased away by a prime herd bull. He will have to try another day, whilst to the victor the spoils as he strutted back off into the midst of the herd to celebrate victory with a favoured cow. 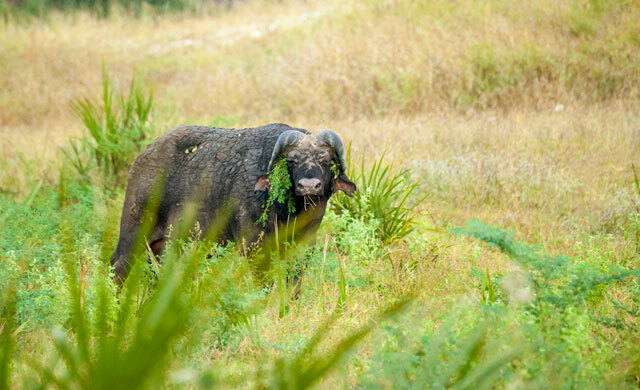 This entry was posted in Phil, Wildlife and tagged Beho Beho, buffalo, camp, Phil, safari, selous. Bookmark the permalink. Can’t wait to visit Selous for the first time after many safaris this September. So sorry we can not stay at BehoBeho because of restrictions of private vehicle. My husband has LOTS of camera equipment so makes that a necessity. I so enjoy reading your blogs so perhaps we can visit during our stay elsewhere. Enter your email address to subscribe to the Beho Beho Bushblog and receive notifications of new posts by email.